Almighty Father, We thank You for Your great salvation plan for mankind and Your beloved Son, Lord Jesus Christ, who came into this world as a living sacrifice. In all His time on earth, He laid His life upon Your will, and loved and served the world. We pray Father, that we become great examples of our Lord Jesus. May we love and serve those around us who need our services and offerings of love. Lord Jesus Christ, we praise You and we glorify You. We give You thanks for Your great Love. We praise You, for You came to fulfill the Father’s will. In Your great love, You saved us from sin and condemnation, and we thank You for this. We pray and pledge that we will walk with love. 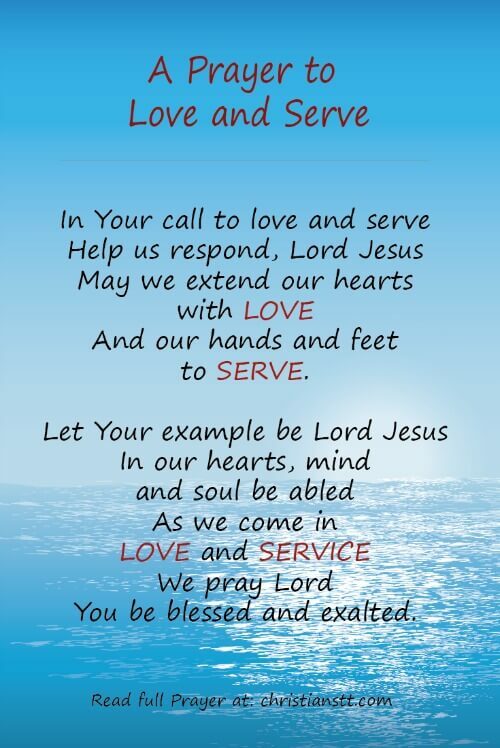 May we be of service to as many as we can in our lives as You called us to be, as is the Father’s will. Matthew 25 : 34 – 37,40 Then the King will say to those on his right, ‘Come, you who are blessed by my Father, inherit the kingdom prepared for you from the foundation of the world. Lord Jesus, may Your life of love and service be our guide to love and serve the under-privileged, the abandoned and the needy amongst us. Help us, Lord, to love beyond measure, without expectations and limitations, those who need our love. Those in prison, rehabilitation centres, and the home-shelters. The old folks who are disowned and lonely and look forward to seeing someone visiting them and extending love and words of comfort. May we gather our time and resources to visit them periodically and extend our love, support and blessings. May we, in all our ability, not forget to visit the slums and street-dwellers. Help us to have a heart, to make time and gather as much help and resources as we can and offer them our offerings of love. Lord Jesus, we love You Lord with all our heart, mind and soul. We heed Your call to feed Your sheep. We heed Your call to look after Your people who are scattered in darkness, abandoned, lonely and shunned by the world. Help us Lord Jesus, as we prepare ourselves in Your service, to endure all things. May we give our time, effort, resources and our love in Your blessed name, Amen!